Many thanks to PLF colleague Tim Snowball for his expert and tireless coverage of yesterday’s hearing in the California Assembly Education Committee, on Riverside Assemblyman Jose Medina’s bill to subject home school families to state inspection of their homes and state review of their curriculum. Much has been made, and rightly so, of the unprecedented and largely self organized turn out of thousands of ordinary Californians speaking against the bill. There was an amazing moment worth noting in the midst of this. After an estimated 3,500 members of the public from all over California spoke against his bill, Assemblyman Medina made so bold as to quote (timestamp 3:06:00) James Madison’s famous passage from the Federalist Papers: “If men were angels, no government would be necessary.” (Federalist 51, Madison). Madison was not making an argument for intrusive government control of people’s lives, including how they taught their children in their own homes (a practice more or less ubiquitous in the 1790s, by the way). His quip about angels was an artful acknowledgment that, human nature being what it is, government is always necessary. Along with the poor, the bureaucrats will always be with us. But the point Federalist 51 made is that the important task is effectively limiting government to protect natural rights. The Assemblyman has it exactly backwards about Madison. Medina’s resort to Madison is even creepier given that Madison authored the Fourth Amendment, which protects all Americans from precisely the warrantless government searches of their homes that Medina’s bill proposed. 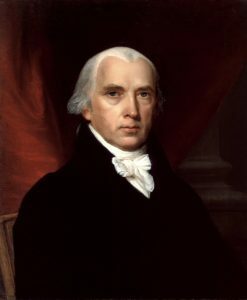 James Madison, Founder, Author of the Fourth Amendment, Fourth President of the United States. Skeptic of Government Power.